Oh China... The weather is warming up (though we've found it doesn't get uncomfortable until July 1, like there's a switch on the cosmic calendar to "thermal") here in Shanghai. Which means it's time for my sister-in-law Holly's favorite time of year. The Belly Season. 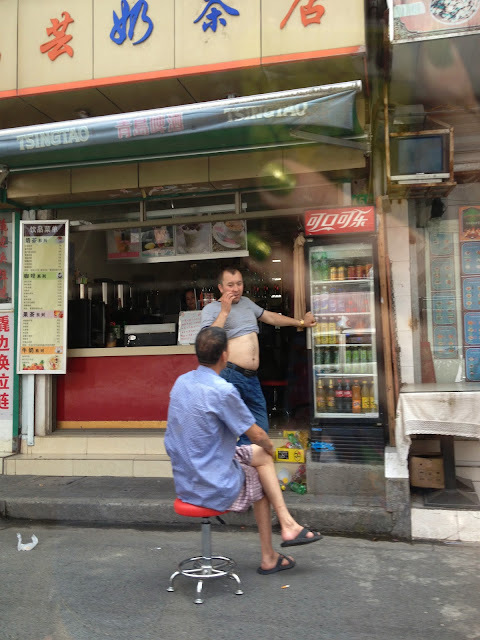 It's time for all the men in China to hoist their tees up into their armpits and expose their flabby guts in an effort to cool down. Today was my first sighting of the year, as we sat at a red light in a taxi. Of course, it's not really Holly's favorite thing, she's quite repulsed by it. As am I. I think I'd be less grossed out if they just took off their shirts completely. This just seems to draw more attention I think. Though probably the worst thing is being in a crowd and having someone's sweaty, hairy stomach brush against you while you cross the street. Holly just doesn't know what she's missing. But she's better for it, I think. Oh my word. That is something! And fantastic. And something.